All smiles: Jordan Houghton and Liam Mandeville found the net in the win against Leyton Orient. Doncaster Rovers could go top of League Two for the first time this season on Saturday but boss Darren Ferguson is looking at the bigger picture. Victory at Stevenage, in Rovers’ game in hand, would see Ferguson’s men rise to the summit. 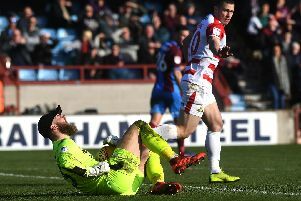 But the Scot is more interested in accumulating points and maintaining recent standards - and also achieving four straight league wins for the first time during his Rovers reign. “It’s a good incentive [to be able to go top] but I don’t want to make too much of it,” said Ferguson. “For me it doesn’t make much of a difference at the moment whether we’re first, second or third. “What does matter to me is that we consistently get results and make it four wins on the bounce. I don’t think we’ve done that since I’ve been here. Ferguson says the opportunity to go eight points clear of fourth-placed Portsmouth is more significant. “You can look at it in different ways,” he said. “Yes, you get to the top. But then again you’re eight points ahead of fourth, that’s the way I’m looking at it. That’s more significant. “It’s always good to look at the league and see that you’re top,” he added. Andy Williams is set to return to the squad this weekend after missing almost two months with an ankle ligament injury.